SCVHistory.com | Newhall | Restored Pioneer Oil Refinery Dedicated to D.G. Scofield, 11-5-1930. Restored Pioneer Oil Refinery Dedicated to D.G. Scofield. News reports | Dedication November 5, 1930. 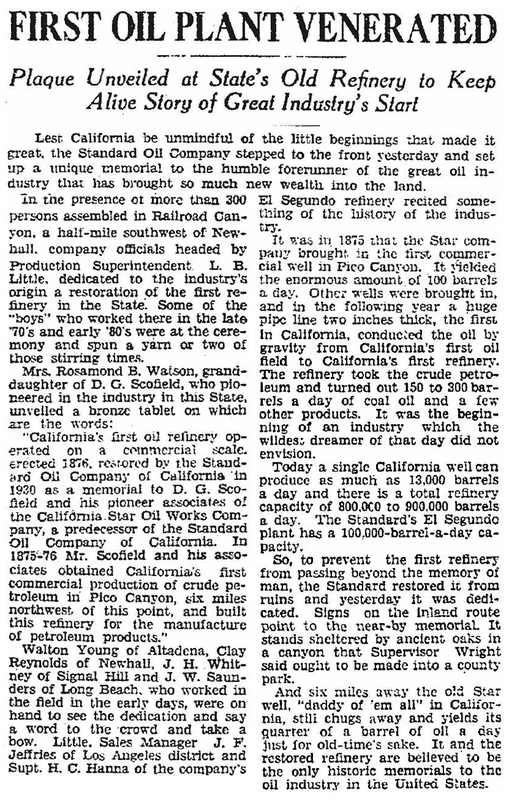 November 5, 1930 — The Pioneer Oil Refinery in Newhall, newly restored by the Standard Oil Co. of California, is dedicated to the memory of pioneer oil man D.G. Scofield, founder of California Star Oil Works, which hired Alex Mentry to bring in the wells in Pico Canyon. News reports courtesy of Stan Walker. Pioneer Oil Refinery Becomes Real Landmark. Standard Oil Company Restores Ancient Plant Near Newhall. Los Angeles Times | Monday, November 3, 1930. Those who may have doubted that there is sentiment in the oil business should drive out to Newhall, Wednesday at 2 p.m., and attend the dedication of the old Newhall oil refinery — first of its kind in the State — as a permanent landmark. At considerable expense the old plant where California refined her first crude oil into kerosene and benzine [sic], has been restored from a crumbling heap to an exact reproduction of its appearance in the early days, by the Standard Oil Company of California. The feature of the dedication will be the unveiling of a bronze tablet marking the plant as a memorial to the late D.G. Scofield and his associates of the California Star Oil Works, predecessors of the Standard Oil Company of California, of which company Mr. Scofield later became president. The tablet will be unveiled by Mrs. Rosamond B. Watson, granddaughter of Mr. Scofield. L.B. Little, general superintendent of the producing department of Standard, will be master of ceremonies and other speakers will be county Supervisor Sidney T. Graves, H.C. Hanna, refinery executive, and Walton Young, who for forty years was active in the Newhall oil field. The public will be welcome. Newhall is the cradle of California's great oil industry. The first commercial oil production in the State was developed in Pico Canyon, a few miles west of Newhall, in 1875. Soon afterward the old Newhall refinery was built and a two-inch cast-iron pipeline was laid to carry the oil by gravity to the refinery. This was the first oil pipe line in the State. The Newhall refinery had a charging capacity of about 300 barrels of crude, compared to the present capacity of Standard's El Segundo refinery of 100,000 barrels a day. The chief product of the old plant was kerosene, as that was before the day of the automobile. A little benzine was made, and a lower-grade product called "slop oil," as well as a small amount of lubricating oil. After a few years the Newhall refinery was abandoned in favor of more up-to-date refineries. Its restoration by Standard will provide another historic landmark to interest travelers. 1. 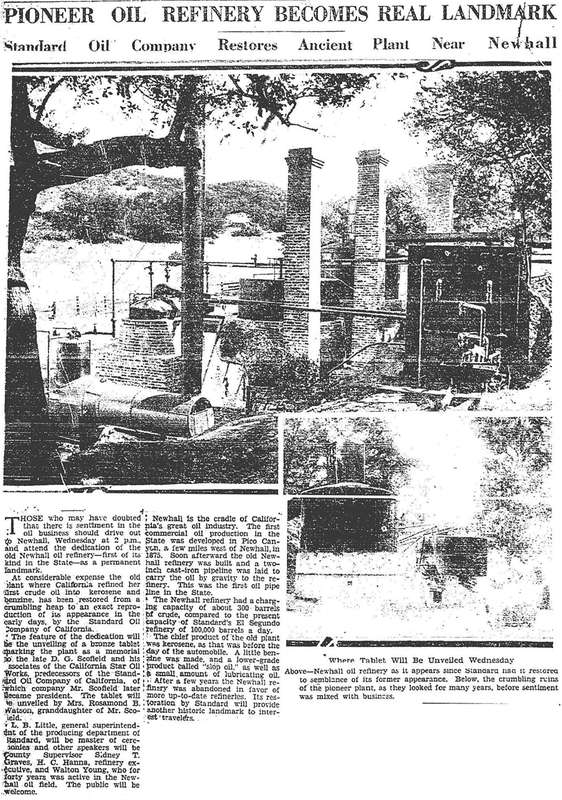 These news reports refer to the Pioneer Oil Refinery off of Pine Street just south of today's William S. Hart Park — not the (uppercase) Newhall Refinery next to Beale's Cut on Sierra Highway, which came later. Ancient Newhall Oil Plant to Be Dedicated Today. Los Angeles Times | Wednesday, November 5, 1930. Newhall, Nov. 4 — Three or four hundred persons are expected here tomorrow to take part in the dedication of the old Newahll Oil Refinery in Pico Canyon [sic] which has been converted into a landmark by the Standard Oil Company. A bronze tablet to D.G. Scofield and his early associates of the California Star Oil Company will be unveiled by Mrs. Rosamond B. Watson, a granddaughter of Scofield, who later became president of the Standard Oil Company of California when that concern took over the California Star Oil Company properties. L.B. Little, superintendent of the production department of Standard Oil, will be master of ceremonies. Speakers will be Supervisor Sidney T. Graves, H.C. Hanna, refinery executive, and Walton Young, for forty years active in the Newhall oil field. The old refinery plant with its tumbled-down machinery and the ground adjacent will be given as a park by Standard Oil in commemoration of the fact that here was the beginning of the oil industry in California. Operations started just fifty years ago. At the time, the refinery's output was about 300 barrels daily of kerosene, latter-day gasoline being a commodity that no one knew anything about, and if they had there was no use to which it could have been converted. Fifty years ago the Newhall refinery was famed for the quality of its kerosene, old-timers here say. "When it was put into a lamp," one old inhabitant stated, "it did not explode the lamp, because the refinery here knew how to take out the explosive something which later was known to be gasoline." This "explosive something," this man stated, was always allowed to run off in waste pipes as useless. 2. Standard retained ownership of the property. 3. Back then there was no California Department of Toxic Substances Control. Plaque Unveiled at State's Old Refinery to Keep Alive Story of Great Industry's Start. Los Angeles Times | Thursday, November 6, 1930. Lest California be unmindful of the little beginnings that made it great, the Standard Oil Company stepped to the front yesterday and set up a unique memorial to the humble forerunner of the great oil industry that has brought so much new wealth into the land. 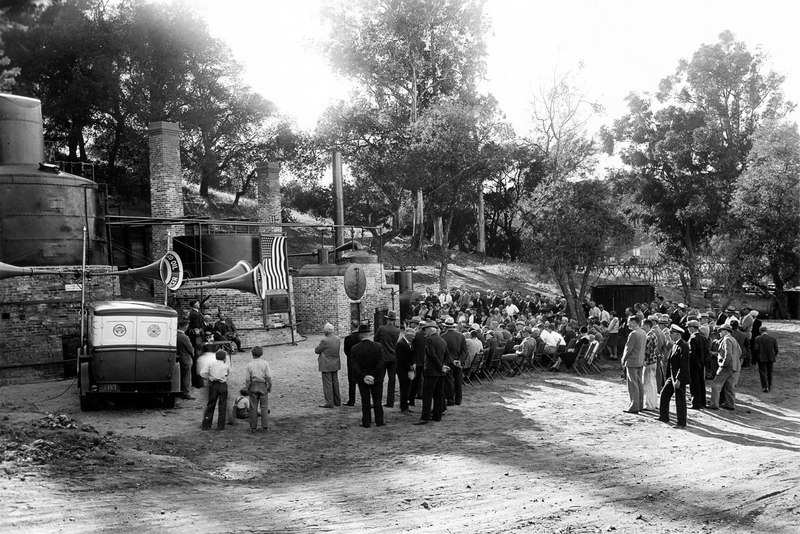 In the presence of more than 300 persons assembled in Railroad Canyon, a half-mile southwest of Newhall, company officials headed by Production Superintendent L.B. Little, dedicated to the industry's origin a restoration of the first refinery in the State. Some of the "boys" who worked there in the late '70s and early '80s were at the ceremony and spun a yarn or two of those stirring times. "California's first oil refinery operated on a commercial scale, erected 1876, restored by the Standard Oil Company of California in 1930 as a memorial to D.G. Scofield and his pioneer associates of the California Star Oil Works Company, a predecessor of the Standard Oil Company of California. 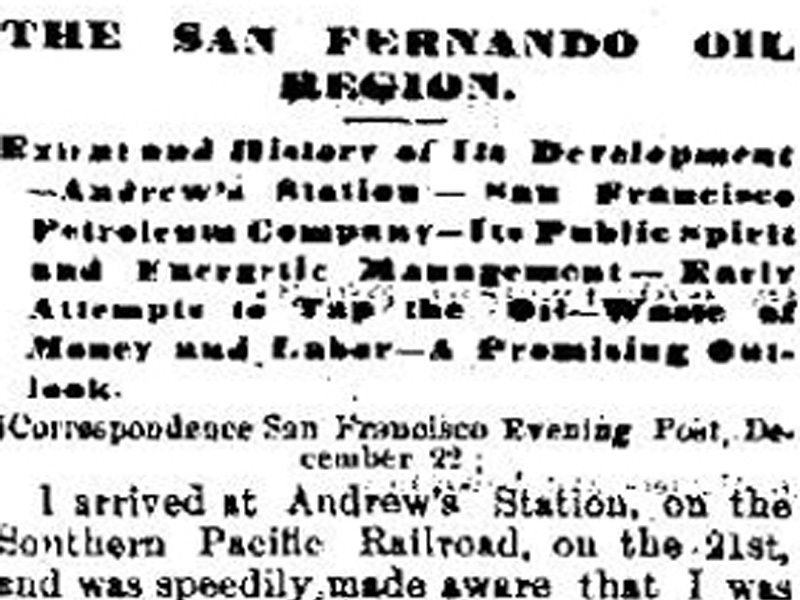 In 1875-76 Mr. Scofield and his associates obtained California's first commercial production of crude petroleum in Pico Canyon, six miles northwest of this point, and built this refinery for the manufacture of petroleum products." Walton Young of Altadena, Clay Reynolds of Newhall, J.H. Whitney of Signal Hill and J.W. Saunders of Long Beach, who worked in the field in the early days, were on hand to see the dedication and say a word to the crowd and take a bow. Little, Sales Manager J.F. Jeffries of Los Angeles district and Supt. H.C. Hanna of the company's El Segundo refinery recited something of the history of the industry. It was in 1875 that the Star company brought in the first commercial well in Pico Canyon. It yielded the enormous amount of 100 barrels a day. Other wells were brought in, and in the following year a huge pipe line two inches thick, the first in California, conducted the oil by gravity from California's first oil field to California's first refinery. The refinery took the crude petroleum and turned out 150 to 300 barrels a day of coal oil and a few other products. It was the beginning of an industry which the wildest dreamer of that day did not envision. Today a single California well can produce as much as 13,000 barrels a day and there is a total refinery capacity of 800,000 to 900,000 barrels a day. The Standard's El Segundo plant has a 100,000-barrel-a-day capacity. So, to prevent the first refinery from passing beyond the memory of man, the Standard restored it from ruins and yesterday it was dedicated. Signs on the inland route point to the near-by memorial. It stands sheltered by ancient oaks in a canyon that Supervisor Wright said ought to be made into a county park. And six miles away the old Star well, "daddy of 'em all" in California, still chugs away and yields its quarter of a barrel of oil a day just for old-time's sake. It and the restored refinery are believed to be the only historic memorials to the oil industry in the United States.